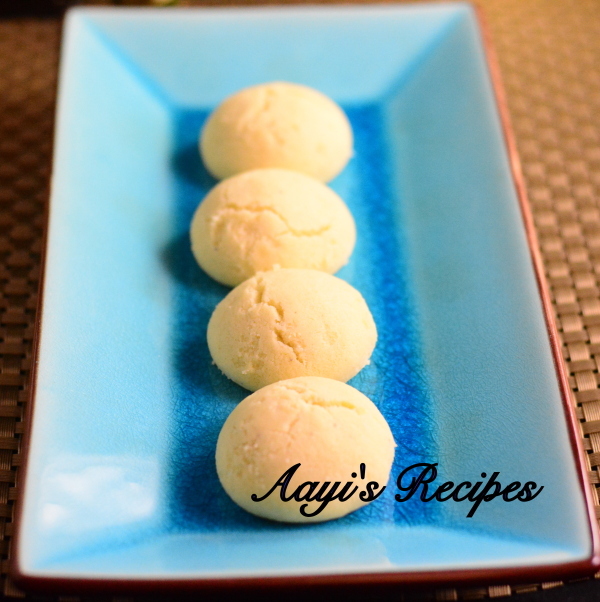 ‘Nankatayi’ or Nankatai can be called as Indian biscuits(cookies). I had thought this is a Konkani name, but recently I came across this name in many of the food blogs. So I guess this dish does not need any introduction. When I was a kid, I was a big fan of Nankatayi. We had the round oven aluminum base and glass top, I haven’t seen any such ovens anywhere these days. It used to take ages to bake anything and with the power fluctuations and power cuts at our hometown, things became worst over time. After getting the oven repaired for many times, finally mom stopped using it. Her Nankatayis were the best I have ever had. I guess it is mostly because of the prolonged procedure she used to follow. She used to make the dough in the morning and start baking in the evening, allowing the dough to stand for 4-5 hrs. When I prepared them here, I cut down the standing time to 30mins (because I was in a hurry). Still they turned out great. Mix all ingredients and keep it aside. (Usually the dough comes out very loose. This time somehow I got it quite wet). Make nankatayi. Bake till they get cracks on top. Heat vanaspati/ghee till it melts and add it to flour. Mix all other ingredients. (Do not add water). Take all the mixture to one side of the bowl (press it using hand, there should not be any gaps in the dough). Leave the mixture for 4-5 hrs. Make small rounds with the mixture. Sometimes the dough breaks easily while making balls. So apply a bit of ghee to the hands and apply pressure with hands while making the balls. Keep the balls on a greased oven proof dish (or on a parchment paper). Bake in preheated oven at 300F for around 30-40 mins (till the nankatayis get a few cracks on the top). Biscuits look delicious! My grand ma used to prepare these for us when we were kids. i was really looking for this recipe .. though i found couple of recipes on the net , i was not so satisfied ..now since this is ur recipe , i can try this blindly ..
& Shilpa one more request , can u please post some more recipes like this which can b prepared just once n last for a long time & also not much oily & spicy ? Hi Shilpa …..My mom just disposed this traditional round oven with a glass top (Bajaj). She used it for many years. My mamama and mom make the best nankatayi. She used to make lot of dough when we all grandchildren went to native place and send the same to the bakery. It is called Narainkatar in Konkani. My mum had the oven too!! Werent they really cute? But I suppose not convenient for the person doing the cooking! Thankx a ton Shilpa I always wanted a tried and tested recipe for nankatai. I am going to make these a soon as I get the time. Btw I had one of those round aluminium ovens some 8/9 years back when i got married. I remember i used to bake a cake for 1 hour in it and the whole kitchen became unbearably hot ,but what came out was a lip smacking cake .So i pay a tribute to those now almost non-existent ovens. Reena, I will see if I can remember any such recipes, because usually all the dishes which can be made and kept for weeks involve deep frying :(.I will surely post here if something pops up in my mind. Anupama, I know what you are saying.I remember we used to wait for the whole day when my mom used the round oven to bake nankatayis. I used to ask her hundred times if it is ready, starting mmediately from the time it was kept in the oven and I used to start crying if power went off in between :D.
Tina, Yes, you can use baking powder. When I prepared this, I was not having baking soda, so I used baking powder and they turned out yummy :). Biscuits looks very delicious. Will surely try it very soon and let u know. Thanks for the recipe. Oh, Shilpa, it looks delicious and the unbaked ones looks like dooth-beda 🙂 and you got the loose mixture to perfection, i am not sure i will be anywhere near to it! Hi shilpa..biscuits looks so yummy..will bake them soon for taniya..thanks for sharing.. 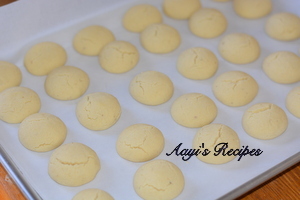 I luv these biscuits..we make something similarly and call them ghee biscuits..i guess the recipe is kinda similar but not sure….few ing i remember r same and may be few ing r extra..
anyway i luv these..nice pictures btw..
That is so simple. Thanx for sharing. I came across your website looking for some baking recipes and saw nankatyai . The biscuits looks very good.. They are still one of my favourites. Sushma, thanks for linking me. I will also link you here. My mother made Naankatayi.She used to add a pinch of yellow color and elaichi powder,this gave a nice flavour and color. I searched a lot for this recipe. I really love this. thanks a lot. One question – Can I try this in a microwave oven? If yes, what are the times i need to maintain etc. Saw ur baking section today. I tried nankatai a couple of times. Mine comes out like butter cookies. But the narayan katar from bakeries in Mlore are hollow in the center. How do I achieve that? Thanks for the recipes, am gonna try it,just one question…do they become nice and hollow and also..the standing time, does it need to be at high temperature. I am in CHicago and the room is usually at around 66-68..is that ok? Please let me know, thanks. PS how do you add your page as a link to my page? Manjula, You have to mix them well to get the hollow center. Leaving the dough for 3-4hrs also gives the good results. Vidya, no problem about the temperature. In any temperature, the effect should be same. 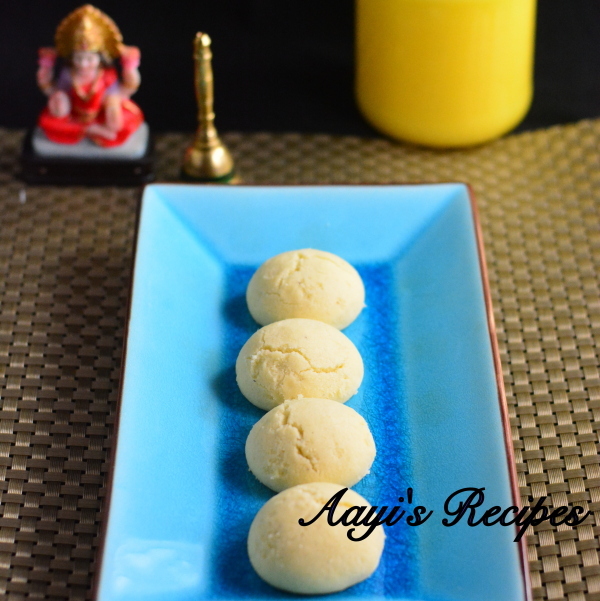 Hi Shilpa….thanks a lot for the recipe…i tried it yesterday and believe me it was the best nankatayi i ever made…had tried baking them before but never so soft and tasty and it’s easy method too. My kids looooved it! Hi Shilpa, am going to try this recipe it looks great, i was wondering wether i can store them for a week without loosing the crispiness? Thanks for all the great recipes! Neetu, yes you can store them in air tight container after cooling them to room temperature. That keeps the crispiness. Last time I had used Crisco shortening for making these instead of ghee, I must say they came out very crispy. But ghee makes them very aromatic. So please choose what suits you. (I heard shortening is not very good for health, so I stopped using it). Hey Shilpa, I tried this today and the taste was superb and it came out crispy yet soft on the inside.. the only problem I had was that the nankatayis spread a lot – I had made them doodhpeda size but while baking they became HUGE and flat! Any idea what I did wrong? The only thing I changed was I used half ghee and half butter.. otherwise i followed it to the T.. Actually, I have the same problem with any cookies I make 🙁 not sure how I manage to mess them up.. Hope you know the answer to my query. Sudeepta, I don’t think anything went wrong. They are supposed to expand after baking. Even the cookies are supposed to expand. Next time, please try with pure ghee, butter might be the culprit, not sure though and make sure to leave enough space in between for them to expand. Believe me, if they don’t expand, they will become like stones :). If I get any more tips, I will let you know. Sudeepta, I confirmed with my mom, the only two reasons might be butter might have made them smoother or the soda might have become more.Last time I used baking powder instead of baking soda, they came very well. can i prepare this recipe using a microwave? what are the timings i need to set? Sowmya, sorry, I never used microwave to bake these, so I don’t know. I tried ur recipe,it turned out to be good. I used granulated sugar, should i use powdered sugar. Divya, yes, it is better to use powdered sugar. I tried nankatai for second time, this time used powdered sugar, also added some cocoa powder for flavor, it was good but i think using granulated sugar also will make cookies good. When I added the 1 cup melted ghee to the 2 cups maida flour it makes it look like a big bowl of pudding or custard, not loose dough. Any ideas what went wrong? Shilpa: Did you add sugar? Yes, I used granulated sugar (1 cup), and 1 teaspoon baking soda. Shilpa: Sorry Mike. I have no idea what went wrong. Since there is 3 cups of dry ingredients and 1 cup of wet, the output should be pretty dry. 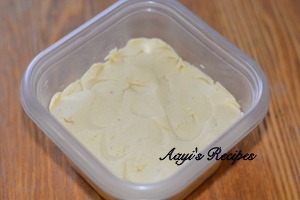 Great recipe easy to make dough! itoo used granulated sugar as i didnt read comments then..wd sure try wt powdered sugar…i got 21 aromatic pieces. I m glad i can give kids home made nankatai.tks a ton for this recipe. I tried Nankatayi 2 times in a span of 4 days .So you can just imagine the response to it.Taste wise they were very good. Thanks a lot for that. But I am not getting the colour.They are little brownish in colour,not like the pure white ones we get in the bakery. Any idea what could be the reason? I used Ghee and Baking powder and allowed it to stand for 4-5 hours. Your site is really good..I have been trying your recipes from just 10-15 days and i just love all of them. Thanks a lot. I tried suqare and half moon shapes also along with the round ones and also added some badam pieces to them. They came out well. I tried ur recipe using microwave too…it tasted real gud..though googling didnt help me for microwave baking..i had to follow my instincts to get gud results! Tks for posting this recipe! i wanted to know whether i can use the tray that is there in the broiler for baking? Thanks for the recipe,I am from konkan and i remember eating these fluffy biscuits as a kid.After reading ur recipe i tried doing ti myself.But somehow I am not able to get them to be light anfd fluffy,even after the said baking time i don’t see nay crack developing on the surface. Could you guess what i am doing wronge? Tried it two times both time the same result. can i use aluminium foil instead of parchment paper? i tired it out…. but it didnt come out the way i thought they would….they were a dark brown on the bottom…. anyways….i’m going to try them again…. can you just tell me give me some idea on preheating the oven? i did it for 10 mins…. Shilpa: Soumya, There were dark because I think they got burnt. You should have removed it early. Yes, 10mins preheating is fine. Shilpa: Sowmya, keep an eye on them when you keep them in oven. When you see some cracks just remove them. If you don’t see the cracks after 15mins, just take them out and check. Sometimes, they look like they are wet when u touch them, but as they cool down, they will be perfectly fine. If this time your nankatayis have burnt within 15mins, then while making next batch, decrease the temperature of oven by 10F or so. Thanks for your Nankatai recipe. I tried it and it out great. I also topped it with some crushed pista and saffron and that gave it a festive touch. My family loved the new item for this Diwali. Hi Shilpa, I was waiting for this recipe from my mom who used to make them a lot when we were young! They were awesome. Thanks for posting this. One question, do you mix the ingredients in a blender or by hand? Shilpa: Kanchan, since the dough is pretty loose, its better to mix by hand. i tried this recipie but i had the same problem what “mike” described. did u mean i cup of melted ghee? because i measured the 1 cup of ghee before melting. the dough was not dry but extremely wet. so i added half cup more sugar and maida. after leaving it for 4 hours it had turned very hard. but somehow i managed making the small balls out of it. after keeping in the oven for 40 mins still it wasnt baked properly.it had few cracks so when i touched them to c if it was baked, it stuck to my finger as the top portion was still moist.. it was like powder on my finger. i baked it for some more time abt 20 mins but it did not bake properly. Shilpa: Brin, I am not sure what went wrong. 3 cups of dry ingredients and 1 cup of wet ingredient should make a very dry dough. I don’t understand how it makes a wet dough, unless granulated sugar is used(or measurements are not right). Actually here dough is so dry that it is hard to make balls out of it. If you touch them when they are hot, it will stick to your fingers, you have to let it cool. I am wondering how they din’t get burnt after you baked them for 60mins!!!!. Actually it was all so funny.. when the nankatayis did not get baked properly in first 40 mins, i kept on adding 10 mins to it n checking it whether its geting baked. this way i might have gove above 60 mins infact!!. then i saw that the house was looking preety smokey n had some burning smell of wax n suddenly the fire alarm went on. n i was so scared what to do. i first put off the oven started to get rid of the smoke… nothing major happened only few of them had little black color on the bottom of it. thank u anyways.. i keep on visiting ur site though i cant prepare most of it.. everything looks so yummy!! thanks for this so easy recipe.can u also tell me how to cook wheat flour biscuits at home as my kids are fond of the biscuits. U and ur site rocks! !I’ll deffi try them out. I have one query though. If I substitute the plain flour with Ragi flour, will it make good ragi cookies? My son is 18 mths old and I’m generally trying to give him healthier stuff, so wondering. Shilpa: I have a ragi cookie recipe with me which is almost similar. So I think it should work out. Thanks a ton for the recipe. I madxe it 2day waiting them to bake, lets c how they turn up. My dough was not very dry as u mentioned it was quite loose more like a roti dough , i used the same proportion as u said n also powdered sugar.Plz tell me where i went wrong, the dough was tasting good . The nankatayi are now in the oven will tell u once they are ready. tried these cookies yesterday and it turned out great. i have a small doubt can we reduce the temp for baking the cookies. I followed your instructions and baked them for 30 min. but few biscuits were over baked. This blog is simply awesome…Thanks for sharing wonderful recepies with oll of us!! I am new to baking. I’ve a common question like other readers about preheating. I am using samsung’s microwave. i want to know for how much time the oven be preheated at 350F (150C) ? After preheating should the balls be kept immediately in the oven? R u sure it needs to be in the oven for 30-40min mine took a lot less about 20min… It definitely tastes great. I made a smaller batch so if it were go be a disaster then it would just be a small one…. i want to know how much temp should be set to bake the cookies?also i m using elecrolux microwave which mode is suitable to bake the cookies? thnx for dis recipe & a wondeful site… i tries so manythings from ue site & results r always cms gud..thnx Shilpa.. Now tell me can i use Non salted butter or pure desi ghee for dis recipe? actualy i don’t get vanaspati ghee here in dis country.. so i was wondering to use desi ghee/butter instead of vanaspati? Shilpa: Yes, you can use ghee or butter of same quantity. Recently tried ur biscuits again ….they came out really good….when i tried for the first time i couldnt figure out whre i went wrong…..but for the second time they came out just perfectly as i wished them to be….Thanks once again for ur recipe. Not sure if you will see this. But is this the same white biscuit in India which has a small red tuty fruity on it? Do you know how to make Britannia milk bikis? Shilpa: No, its not same, they have slightly different taste. I will post if I find the recipe of brittania bikis. I made this and it was very yummy. thanks a lot. Easy recipe. I am trying this right now. My first batch of cookies came out ok. They didnt have cracks and slightly brownish. But, they tasted fine.! Shilpa: Did you use salted butter or something? Thanks for sharing this recipe. In my childhood days we too had an aluminum oven with a round glass window. So happy to know you had a similar one. You are right, dont get to see it these days. my mothers makes this nankatayi. but i want to know if i can make it in microwave, as i don’t have a oven to pre-heat. 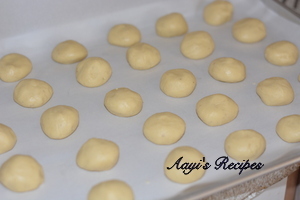 Shilpa: You can try making them in microwave(Try with a small batch first). I haven’t tried it, so can’t give more details. Sorry. The nankatayis were reaaally very tasty.The whole batch finished within a day.I added whole wheat flour 1/4 cup,due to which I got golden coloured nankatayi ,also some demarara sugar was added [ 2 Tbs ]which gave a crunchy taste. Very useful recipe !!! Thanks from Sri Lanka. This recipe of yours reminds me of my childhood days. I just wanted to know if we can substitute vanaspati with Crisco shortening? It would be great if you could let me know about this as I am very eager to try out this recipe. Thanks in advance. Shilpa: Yes,you can use Crisco shortening. yesterday i tried dates cake receipe and it turned out very good, it was my first time in making this cake and also trying my electric oven. i used eno fruit salt instead of baking soda but anyway it turned out good. so i thought to share this with u. Looks really yummy Iwldlike to know the degree for pre-heating and 300F is how much celsius…..cos my owen has only in Celsius degree not farheniet. Shilpa: 148C. Btw, if you type “300 F in Celsius” in google and hit search, it gives you the conversion. Hi, I always wanted to eat those nankatayis ..i m based in uae * & muscat for past 13 years good i saw this website recently…am in love with your website…. as i am away from home and i miss Mumbai.. I am from Karkala in Udupi district and love konkani food. Your website is something which i use everyday now. Thanks for sharing all the recipes. By any chance, do you have recipe of Laabu Curry. Laambu is the round white mushroom we get in South canara before rainy season. Is there is any way to use substitute for Vanaspati/ghee.. today i tried with half oil and half margarine . but i am not satisfied with the result . Shilpa: Sorry, I don’t know. As far as i know, oil won’t work in this. your method is good but i need microwave,s nankhatie is how can make. i remember going to a bakery at evening time with the dove prepared and rounded. they would put nankatie in the cold oven (bhatti). 2) how much time for baking i have to give. 3) I also want to know what indian baking items can be made in OTG as i am a pure vegetarain. Shilpa: The temperatures I have mentioned on this site are in F. Looks like your oven has temperatures in Celcius. So convert the temperatures accordingly. You can make vegetable kababs/naan etc. Thank you for this wonderful recipe. I had been looking for a recipe which did not ask for Dalda/vanaspati as its difficult to find it abroad (I live in UK). The nankhatayi turned out great and I have now tried a variation using half and half wholemeal flour and plain flour and also adding ragi flour. I have to mention that when i mixed the wholemeal flour and ragi flour, the mixture was wet as compared to the one with just plain flour. I added some more plain flour and the nankhatayis still came out well. I saw a few comments which said that their mixture was too wet, so maybe adding some more flour upto another 1/4 cup or slightly more to get a working consistency might help. I increased the temperature to 200 degrees Celsius and they got done in around 12 minutes. namaskara !! tried these out today and the first batch got over as soon as it was out of the oven !!! really yum !!! i did not keep the dough for 4- 5 hours but baked it immediately. I baked the cookies now and savoring them as they are warm.. they are yummy. They remind me of my bakery in Bangalore where I used to get them from! Thanks much. hi shilpa how r u? hey dear by mistake i put atta powder i mean whole wheat powder ryt now dont know wht to do…..feel like throwin it but also dont feel like throwin…..hey shipa plz help me urgent!!!!!!!!! plz plz…first time i am cooki biscuit….hmmmm went wrong …..
shilpa if i cant prepare cookie in this dough …for wht can i use this batter or dough …can i prepare anything else in this dough….bcoz i dont want to throw it…plz help……. I would have tried to bake the same and see how it works. I don’t know if it will work or not. Hi tried them out but my 1 st batch were badly burnt at the bottom:(…………so reduced the heat and time and they came out OK………but i could not get the white colour,they were cream colour,do u think it is b cos of excess ghee?? also should v wait for ghee to cool down a bit or is it ok 2 add immediately?? I tried to make them twice without success. I used “bura” instead of powdered sugar. Both the times the nan khatai’s simply turned flat and refused to cook. The end product was cookie shaped and too soft. Cooked them for a longer duration and still the same thing!…they were extremely soft and undercooked. Do u have a clue as to what could be the possible reason? Why are they turning flat and soft!? Sorry, I have no idea how bura works. Can you suggest how to reduce the calorie content? Shilpa- I made these for the first time a few weeks back using a very-similar recipe- they are awesome, and yours are beautiful! Can I powder the regular sugar and use it instead of powdered sugar.do I have to add corn flour if I use regular sugar? Hi Shilpa, I have tried ur nankatai. They really come out so well that my kids and my husband love it. Thanks to aayi.